Due to unforeseen circumstances, Newark Riverfront Revival and Hackensack Riverkeeper are suspending our Newark Boat Tours for the rest of the 2016 season. We expect to return to normal operation in June 2017. We apologize for any and all inconvenience and we thank you for understanding. All donations collected for cancelled programs will be refunded. This entry was posted in Uncategorized on August 26, 2016 by riverfrontcoordinator. Explore Port Newark This Sunday (August 21st) with Newark Boat Tours! Sunday, August 21, Boat Tours to Port Newark with Hackensack Riverkeeper! The Port of Newark is the largest Port on the Eastern Seaboard and the 2nd largest Port in the United States. Experience the Port from the Passaic River and Newark Bay with our Port Boat Tours with Hackensack Riverkeeper this Sunday at 11am and 1pm. Suggested donation is $5 for Newark residents and $15 for non-residents. Must be 5 years and older. If you are interested in joining us on August 21, please email newarkriverfront@gmail.com or call (201) 341-8311 to reserve your spot. This entry was posted in Uncategorized on August 20, 2016 by riverfrontcoordinator. This entry was posted in Uncategorized on August 13, 2016 by riverfrontcoordinator. Father & Son Complete Kayaking Expedition on the Passaic River and Donate Funds to Newark Riverfront Park! Big thanks to Brian Snow and his 13 year old son Skyler Snow who graciously donated the proceeds of their kayaking expedition down the Passaic River to Newark Riverfront Revival programming! Their courageous journey ended at the Boat Dock at Newark Riverfront Park and their donation will go towards our free public kayaking days! Take from Skyler, the Passaic River is still a gem to be explored! “Despite the pollution, there are some beautiful sights to see on the Passaic,” Snow concluded. This entry was posted in Uncategorized on August 2, 2016 by riverfrontcoordinator. Save the Date! Friday, August 12 – Riverfront Movie Night Featuring Purple Rain! Don’t miss your opportunity to see the iconic film that was the catalyst for mega-fame for the multi-talented musician and performer Prince along the banks of the Passaic River at Riverfront Park. Bring your blankets, chairs, and snacks and watch this classic under the stars. 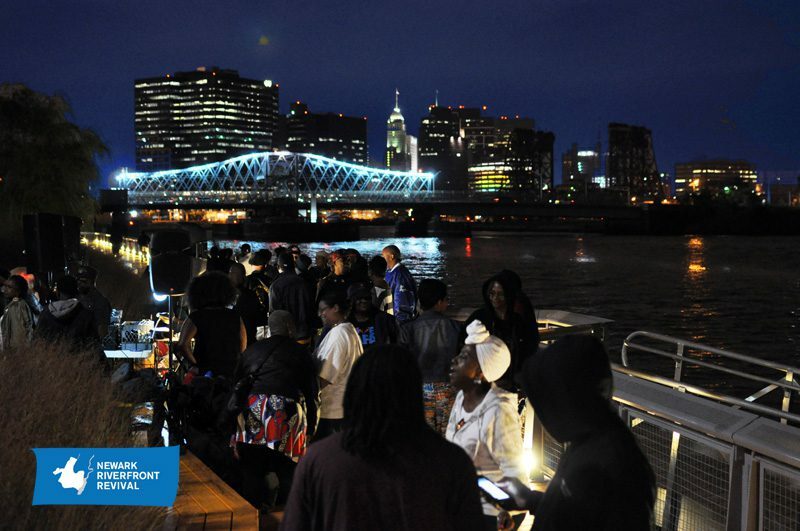 Thank you to all of our sponsors, partners, and supporters for making 2015 a summer to remember at Newark Riverfront Park! We continue to build on great programming, park stewardship and helping to reconnect Newarkers to their River!!! Special thanks to National Endowment for the Arts, Victoria Foundation, The Trust for Public Land, Newark Office of Film + Television, Panasonic and Seidler Chemical Company for their generous contributions and to our partners, the City of Newark, County of Essex, Ironbound Community Corporation,Friends of Riverfront Park, and Hackensack Riverkeeper for their continued support. Hope to see you all this summer! This entry was posted in Uncategorized on July 30, 2016 by riverfrontcoordinator.